← The New York Philharmonic, 8 May, 2014. A Howard Hanson Opera in Carnegie Hall. 7 May, 2014. We arrived in New York about 3 o’clock in the afternoon and had time to check into our hotel, unpack and grab a bite to eat before going to Carnegie Hall. The concert we’d hear was being given by the Rochester Philharmonic and was devoted entirely to a concert presentation of Howard Hanson’s opera Merry Mount. Including the orchestra and chorus, more than 1000 people had come from Rochester to display their cultural mores in the Big Apple. Spring for Music is the idea of Thomas Morris, its Artistic Director and CEO. Morris is a past manager of the Boston and Cleveland Orchestras and at present, director of the prestigious Ojai Festival held among the plush hills north of Los Angeles. Thomas and I are casual acquaintances. He began his life in music as a percussionist and on occasion has had opportunities to practice his early craft. In Cleveland he played cymbals with a professional band conducted by Fredrick Fennel. In Ojai, Nexus invited him to play triangle and cymbals in Les Noces. Both were captured on CDs, which prove him a superior player and musician when he’s not shepherding other people towards fulfilling their music endeavors. The beauty of Spring for Music took some time for me to appreciate. Its mandate is to encourage creative, experimental programming free of financial or commercial considerations and not normally undertaken by the ensemble. Interesting submissions receive invitations to New York City and financial support from a bevy of foundations and wealthy individuals. Secondarily it provides a rallying point for community leaders and patrons of the arts and of course, an opportunity to play in iconic Carnegie Hall. Some of the most recent participants have included the New York Philharmonic which gave the New York City premier of Chris Rouse’s Requiem, the Seattle Symphony which played the large work Become Ocean by John Luther Adams and the Winnipeg Symphony which programed contemporary Canadian works including Murray Schafer’s First Symphony. In an subsidiary category, the Buffalo Philharmonic is leading with the largest cohort of native supporters attending the festival. The subtext of her question was obvious. “Who would come from Toronto to hear the Rochester Philharmonic?” She had exposed a provincials inferiority and became even more uncomfortable. I could have answered no and told her truthfully that we had booked the wrong week of concerts. We had planned to hear the Philadelphia and Atlanta orchestras last week, but after discovering our hotel and airline booking errors, we decided to embrace fate rather than trying to change arrangements that now included Rochester and the New York Philharmonic. But I didn’t. Instead, after a short silence I told them I had played in the Rochester Philharmonic 48 years ago. Now, incredulity was replaced by perplexity. The couple were saved by the arrival of Rochester friends and we were forgotten. My wife and I slipped away. Our box had the worse seats I’ve had in my entire concert going life. It held eight people and we sat at the very back on bar stools, our heads about a foot from the ceiling and it was hot. All we could see were the backs of the other occupants heads with no view at all of the stage. I complained to the captain of the concessioneres who said she’d do what she could, but I was not expecting any relief. Voila, just before the downbeat, our door opened and the captain urged us to quickly follow her. She led us to an empty box directly in the center of the tier and said, “It’s all yours”. Indeed it was. The box to the right of us held an engineer and producer from radio station WQXR. During intermission I heard someone calling my name and was surprised to see David Smith in the box to our left. As a young boy David had begun his percussion studies with me in Rochester and went on to a lifetime career in the U.S. Army Band at West Point. The Hanson work was suggested byTom Morris. Hanson’s orchestration was always turning corners to reveal new and interesting sonic vistas, never relinguishing its professionalism to boredom. This talent has kept his works alive. But the chorus stole the show. They were prepared and never fell below fabulous. They produced hair-raising fortissimos and delicate pianissimo passages, all beautifully in tune and with clarity of diction. Though occasionally submerging the Philharmonic strings and winds, the choristers were too good to fault. Together with the important snare drum rhythms, they never slowed the music’s forward momentum. I felt those rare quivers of joy which come when performers are peaking and can’t wait for the next note. 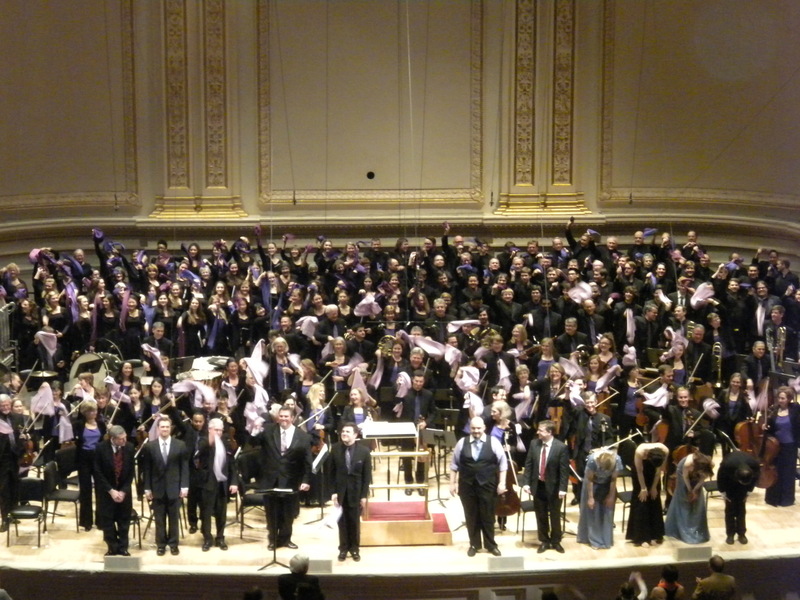 Rochester Philharmonic with towels and fans in Carnegie Hall, NYC, 7 May, 2014. As a football fan I’m used to seeing 80,000 people waving magic towels at their home team, but I was bemused when the crowd from Rochester pulled out Philharmonic towels and started waving them at the stage. But it didn’t end there. After the third curtain call, orchestra and chorus members waved their own towels at the standing audience. Okay, whatever turns you on. The first performance of Merry Mount ,Op. 31 took place on 10 February, 1934 and received 50 curtain calls. At least that’s what the program said. After 4 years of what the New Yorker Magazine music critic Alex Ross called the best idea to hit New York in decades, Spring for Music, due to a lack of funding has given us its last year. Poor New York and poor US. Well Tom, you tried. See you at the next incarnation of whatever. It’ll be good no matter what it is. Howard Hanson (b.1896, Wahoo, Nebraska. d. 1981) was a distinguished composer and educator. At the request of George Eastman, Hanson became the director of the Eastman School of Music and guided its developement into one of the most prestigious music schools in North America. One of the last concerts I played in Rochester was in Kilbourn Hall with Hanson conducting the Rochester Philharmonic core orchestra. Hanson used these year end concerts to present his Quiet Music Award to a student composer. This year Hansen faced the audience and told them there would be no winner. The student compositions had become too brash, dissonant and loud to deserve the honor. I believe this was the last concert he conducted at the Eastman School.